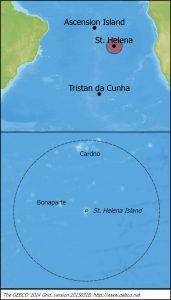 St Helena, around 445,000 sq km of the south Atlantic ocean and home to whale sharks and humpbacks, is now also designated as a protected area. "A 200 nautical mile Maritime Zone in the sea around St Helena has been designated a Marine Protected Area (MPA) (see attached map) – announced at the 2016 ‘Our Ocean’ Conference hosted by US Secretary of State John Kerry in Washington DC on Thursday 15 September 2016. The MPA and subsequent Marine Management Plan for this area is a significant step forward for St Helena to meet both local and international commitments, and to protect local maritime interests. Part 1 of this Q & A explains what an MPA is and why is it important, Part 2 next week will look at issues relating to fishing in the MPA. What type of MPA does St Helena have? Under the IUCN categories, the St Helena MPA is a Category VI (Sustainable Use) MPA – which means marine activities and resource collection are allowed but managed in a manner that incorporates cultural values and sustainability. What does it mean to have a Category VI MPA? It means that we will aim to conserve our marine ecosystem, together with our culture and traditions, to ensure it can be utilised and enjoyed by future generations. It also means that all marine activities – for example fishing and tourism – must be carefully managed to ensure minimal impact on the marine environment. How do we go about ensuring that our activities are managed in line with category VI designation? IUCN have set guidelines for the different categories of MPAs which must be applied. By legally declaring our MPA we have to demonstrate that we are going to live up to those guidelines. The local community, policy makers, decision makers, senior managers, agencies and other institutions must now align themselves with these MPA guidelines if they have not done so already. How is marine tourism managed? Marine Tourism activities have the potential to disturb marine wildlife and their habitats. To ensure that tourism activities minimise this disturbance, whilst still creating a good tourist experience, controls must be in place. All marine tour operators will be required by law to have a licence to be able to undertake such activities and prove that they are abiding by their licence conditions. Do we have a marine tourism accreditation scheme? In order to become accredited, marine tour operators must attend various courses with the local environmental authorities and demonstrate through assessments – including written and frequent spot checks – that they are aware of, and are managing their businesses within the guidelines. We are proud to say that all of St Helena’s marine tour operators have been accredited through our pilot scheme and that spot checks have proved successful. How is local marine recreation managed? Marine recreation is an important part of St Helena’s life and culture, and the declaration of the MPA will help ensure that the marine environment will continue to be enjoyed by future generations. Recreational activities, such as fishing, will be monitored to ensure that they do not threaten the long-term sustainability of St Helena’s environment. How will we fund the implementation of the MPA? The UK has pledged £20 million over the next four years to support the implementation, management, surveillance and crucially the enforcement of new Marine Protected Areas in the Overseas Territories. This resource will open doors for St Helena to access more effective enforcement options. How will local fishing be managed and enforced? There is current legislation that gives authorities the provision to licence fishing activity and impose conditions. But this legislation is dated and is not as robust as it should be. A new Fisheries Ordinance and Regulations, and a new Fisheries Licensing Policy is currently being drafted and will be adopted within a few months to provide improved management of fishing. A dedicated marine fisheries enforcement post is also being developed to support awareness and compliance. This post will also enforce fisheries law, provisions for marine tourism and fisheries licences granted for recreational, sport and commercial fishing. How do we know that we’re not taking too many fish? St Helena’s fishing industry principally targets tuna. Tuna are highly migratory fish that travel vast distancesin the ocean and therefore need to be managed in co-operation with other countries that fish them. To achieve this, St Helena (through the UK) is a member of the International Commission for the Conservation of Atlantic Tuna (ICCAT), which manages Atlantic tuna stocks. All of St Helena’s commercial fish catches are landed at Rupert’s and the catch from each boat is recorded. The Marine Section makes regular visits to the cold store to measure and weigh samples of fish caught each month to ensure that ICCAT is provided with statistics to gauge the stock which migrates through St Helena’s waters. In addition, various other statistics are collected to understand growth pattern and lifecycle details of the fish caught here. A tuna tagging scheme is currently underway which will provide evidence of how the tuna stocks move around the ocean and residency within St Helena waters if recaptured. How will St Helena monitor and tackle illegal, unregulated or unlicensed (IUU) fishing activity that might happen in St Helena’s waters? St Helena will utilise satellite monitoring systems to determine if there is a problem with IUU fishing in our MPA. The most likely locations of illegal vessels are the seamount hotspots that are currently fished by St Helena boats – which are required to report any sightings of other vessels. If necessary, St Helena can use offshore boats to undertake specific patrols. What happens to the evidence collected on IUU fishing? Any reports of illegal fishing are passed to the Marine & Fisheries Division of the Foreign & Commonwealth Office for further follow-up with the Flag State parties. What has changed now that our MPA is declared? The declaration of the MPA means that there is now a clear framework to ensure the sustainable management of St Helena’s marine resources. Whilst the MPA will not affect traditional fishing methods, it will require better regulation and collection of data associated with fishing and any other marine activities. Having declared the MPA, St Helena – with the support of the UK Government – has an obligation to ensure that it is thoroughly and responsibly implemented. How will the MPA affect the local fishing industry? St Helena’s traditional form of fishing is pole and line – renowned as the most environmentally friendly method of fishing in the world. So in terms of practicality, there will be very little change. But new legislation and licensing will require logbook keeping for boat owners, observer coverage and stricter conditions for licensing in terms of littering etc."